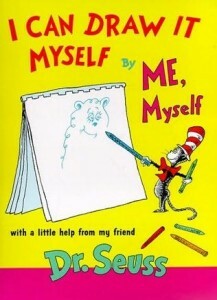 I Can Draw It Myself by Dr Seuss is a coloring book that encourages children to draw their big something. I was thinking today how independent my daughter is and always exploring things on her own. It reminded my of a time when she was first able to express herself while trying to do something on her own. It’s really easy to try and do things for others. It’s quicker, easier and often less frustrating. Sometimes we jump to be over protective. That won’t teach a child self-confidence though. On this particular day, we were at the top of the stairs and ready to walk down. She kept saying – self – and I asked her if she wanted to do this by herself. She nodded yes with a giant, confident smile. So I positioned myself to walk next to her so my leg was available for her to hold onto. She was able to walk down the stairs under her own march, yet she was safe enough not to go tumbling down. She held onto my leg for support, not my hand. It wasn’t about her doing it on her own. It was about giving her the confidence that she can do it her own way – even if she still need help. That lesson was that just because someone needs support, it doesn’t have to be pushed into their face that they need it. Support can be covert and that builds confidence in the person that needs it. It makes it about themselves so they own what they’re doing. Do you find yourself being one to jump into solving a problem when asked or do you help someone solve their own problem? What ways do you show support in others so they own their problems? My middle child seems to have issues to confidence. Thanks for these tips in helping me to help himself. Found you on Twitter Moms.